Добавлена новая версия KyrSpell 2.3. Где модуль состоит из оболочки откуда можно установить саму систему проверки орфографии кыргызского языка KyrSpell 2.3 и удобные раскладки клавиатуры для кыргызского языка. До этого раскладки клавиатуры были включены в KyrSpell но из за разных версии ОС куда устанавливали пользователи выходили ошибки при установки. Поэтому было решено предоставить самому пользователю решит какую именно раскладку установить в систему. В программе есть 3 вида раскладки. Выбирайте кому какая нравится и устанавливайте в свои . При установке KyrSpell 2.3 выберите версию MS Office которая у вас установлена – 32 или 64 бит. Раскладки клавиатуры совместимы с Windows XP и Windows 7 – 32 бит и Windows 7 – 64 бит. Новое! Добавлена версия для 64 битный MS Offfice. Теперь можете устанавливать KyrSpell 2.3 для 32 или 64 битные MS Office 2007-2013. Прямая ссылка для tamgakit-orfo-2013.exe файла. Ссылка для скачивания с GoogleDrive tamgakit-orfo-2013.exe файла. Прямая ссылка для tamgakit-orfo-2013.zip файла. Ссылка для скачивания с GoogleDrive tamgakit-orfo-2013.zip файла. Terminology dictionary with full-text search function. The dictionary contains about 5 thousand terms in Russian as well as their translation into the Kyrgyz language. Allows you to quickly find the desired translation of the term in the Kyrgyz language. Has a clear and intuitive interface. How do you know when typing, as well as in the layout of books, newspapers and magazines inevitably arise typos, spelling errors. But in the adjustment process, proofreading, etc. These errors are corrected as they are discovered. But no one is immune from what mistakes can be overlooked and not seen, and these errors are found already in the finished magazine or newspaper. Therefore, there are tools that automatically check the text for spelling errors, and if any is found, then notify the operator or user. These include built-in spell checker text editors such as MS Word, OpenOffice and so on. Also the same function is a program that is directly executed layout. These programs include InDesign. 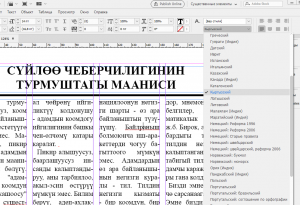 Recently, this program gets more and more popularity with designers, so it was decided to implement a spelling checker and hyphenation Kyrgyz language for this program. In this case, it was necessary to take into account that this additional function makes changes in the usual course of the coder, or require minimal effort. Due to the fact that InDesign is easily supports the introduction of third-party plug-ins, this problem is resolved very correctly and competently. Therefore, this program comes as a plug. The plugin itself, ie that part of the program, which deals specifically with the spelling checker is part of a software product – “Tamga-KIT, which is being developed and refined for over 10 years and is a leader who can say a monopoly in our country in this sector of the software. Basically Dictionary contains about 100 thousand words. Where in addition to basic words additionally contains first and last names, place names of cities, settlements in the Kyrgyz language. But the main highlight of this program – a unique algorithm for word formation and retrieval of words in the dictionary. The dictionary is regularly updated with new words. 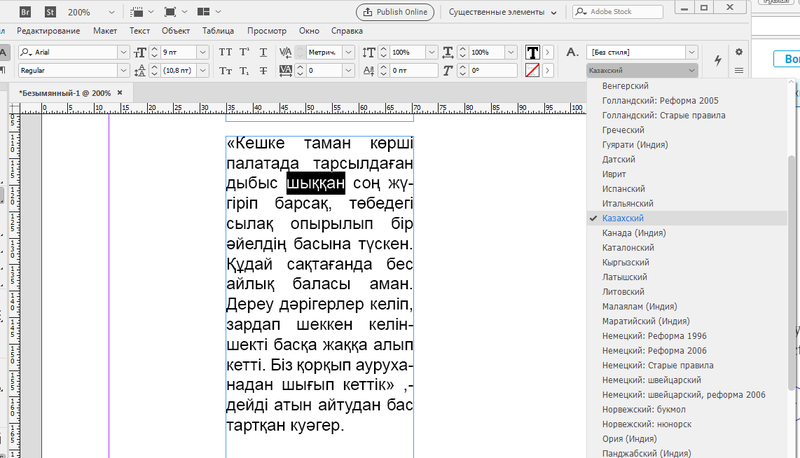 This plugin allows you to automatically transfer words into an editable document InDesigna the rules transfer the Kyrgyz language. 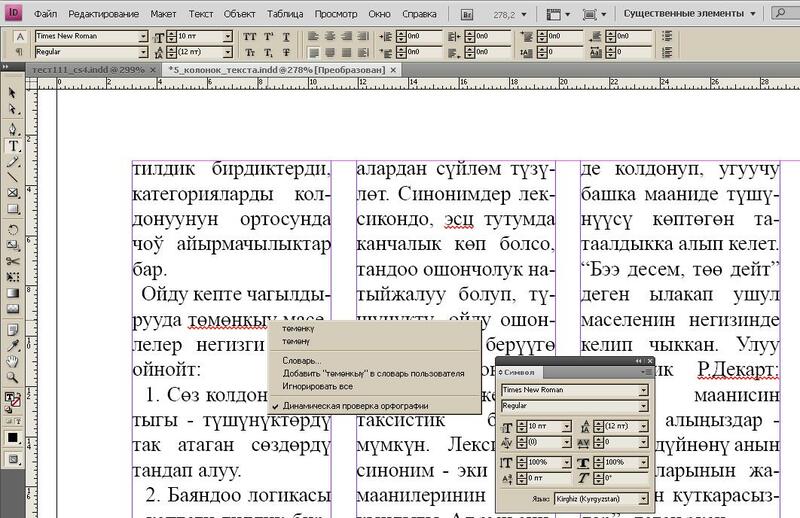 As you know default InDesign endures Kyrgyzstani words on Rules transfer Russian language. 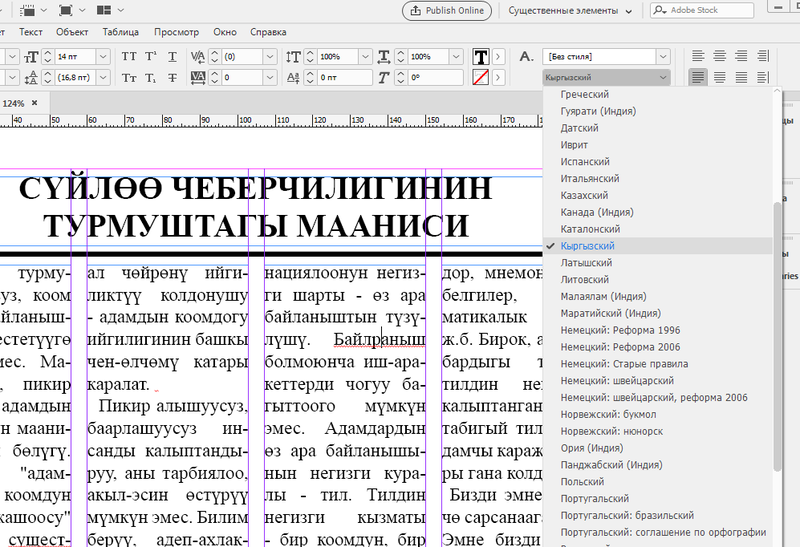 But for words that contain three Kirghiz letters, InDesign does not exercise the transfer. This plugin solves this problem easily and quickly. To do this in the text had InDesigne linguistic markers “Kirgiz (Kyrghyzstan)” and abazts had marked as “transfer”. The creation of this plugin has been implemented with financial support, “HEF Media Support Center” and is free to all comers. Updated plug-in or new versions can get a “HEF Media Support Center» («Freedom House») or from the author of the program. Released version of the plugin, hyphenation and spelling for InDesign CC 2017 and CC 2018. At the moment, versions for 12.0, 12.1 and 13.0 (32 bit and 64 bit) are ready. Instead of the language “Kirghiz (Kyrgyzstan)” now in the list of languages the Kyrgyz language is displayed as “Kyrgyz”. Added language “Kazakh” when choosing which hyphenation is carried out according to the rules of the Kazakh language. Algorithm for the transfer of the Kazakh language is almost identical with the Kyrgyz language, it differs little.